Parking: Valet parking is available at the Hilton entrance. Self-parking is available in the Fort Brooke Parking Garage, adjacent to the hotel (entrance on Whiting Avenue). The entrance to the Hilton is located on the 3rd floor of the parking garage. Please be aware that this event will be photographed and videotaped. By attending the event, guests consent to the use of their name and/or likeness without compensation in any and all media. To request ADA accommodation call 813-974-1101. We hope you will join us for the 6th Annual Florida Inventors Hall of Fame Induction Ceremony & Gala. To become a sponsor complete and return Sponsorship Form (PDF) or Ticket Order Form (PDF). 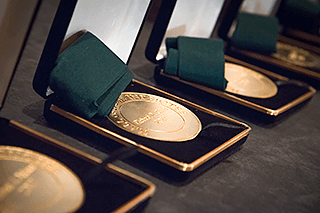 If paying by credit card you may also purchase tickets through the USF Event Portal by clicking on SELECT FIHF: 2019 6th Annual Induction Ceremony and Gala – Sep. 20, 2019. For more information regarding sponsorship opportunities contact: hollybehrend@floridainvents.org or 813-974-1101. For all sponsorships, please note the following: Pursuant to IRS guidelines, support is defined as a “Qualified Sponsorship,” which means no endorsement of your business, qualitative or comparative language, price information or indication of savings or value can be included in written words or in program remarks. In essence, your organization can be acknowledged through simple use of your name, logo and location, but no message that promotes or markets any trade or business, or any service, facility or product is permissible.